Have you been searching for the best golf cart heater but not had much luck in find the right product? There's no need to waste more time searching as your search ends here! We have heavily researched all the different types of golf cart heaters, and selected only the best golf cart heater for you. No one wants to play golf in the cold, that's no fun. Golf cart heaters are a great way of just giving you a burst of heat to make you feel comfortable when you're travelling between holes. In this article you'll find our detailed golf cart heater reviews of all the products we recommended and a buyer's guide to help you select the best golf heater. There’s nothing quite like a round of golf to clear your head and relax. But at times, when the temperature drops and it's cold outside, it can be chilly sitting in a golf cart even with the flaps zipped up. Thankfully there is a solution – golf buggy heaters. In this article we will explain a little about them, the types and what to look for when deciding which one to purchase. I already know about Golf Cart Heaters. Take me to the Reviews! Most golf carts are relatively open, which can make you cold and uncomfortable when driving around the course yet with a simple, inexpensive addition to your kit you can be enjoying the course again with the warmth of a golf cart heater. Spending a little on one of these great heaters should allow you to play golf for longer over the chillier months. These little packets are heated in a microwave before hitting the fairway and keep your hands and feet warm for a couple of hours. Useful to pop in your bag if you have a long wait between shots but not ideal for more extended periods, for that you need something with its own fuel source. These units usually fit on or under the dash with a universal mounting bracket. As they are electronic, there is no worry about running out of fuel, but they are one trick ponies so to speak. You can't quickly move them from one buggy to another nor can you fit them onto club buggies if you are visiting another course. Also, if you are not confident about wiring it yourself (for example opening the battery compartment etc. ), then you will have to pay for a professional to install the unit with all those associated costs. Another consideration is whether you plan on using your heater for other hobbies such as camping, fishing, etc. With some propane units, you have this flexibility. Measurement of a heater's output is calculated using British Thermal Units or BTUs. The higher BTU equates to the higher power and heat generated. Obviously, for a small area such as a golf cart, you won't be looking for a high output heater, but knowing the BTU is still essential. To decide which heater will be most suitable you need to know the heating area you wish to heat up. Getting a heater which blasts out enough power to heat a squash court isn't going to be cost-effective or necessary if all you want to warm is a golf cart. Purchase a heater which will comfortably heat the cart space. A simple way to deduce your carts square footage is to multiple the longest and shortest sides. Most manufacturers will list the square footage their heaters will heat so be guided by this. The burn or runtime is the amount of time your heater will last on one fuel canister. Useful to know as the closer to 100% burning a unit has, the more economical and cleanly it will burn meaning money saving for you and less of that horrible gas fuel smell inside your cart. These small units are made to be extremely portable, but it's worth remembering to take into account the weight of fuel canisters you may also need to carry with you. Plus spares if your unit has a limited run time. Think carefully about all the situations you may use a heater. 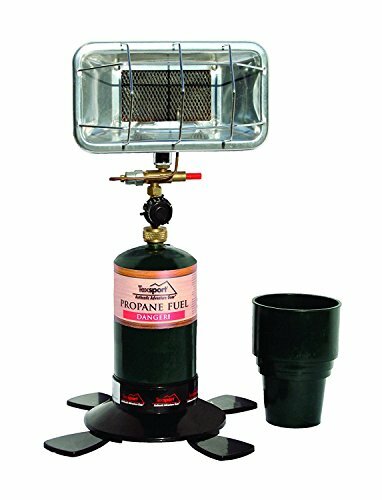 If you also plan to use your heater say for example camping or fishing, you may wish to look at models that have stand attachments for example to broaden their usefulness. The smaller propane models may have a carrying handle, while larger units have integrated handles which can be folded flat for storage. For ease of movement, look out for the Mr. Heater® range of carrying bags which have been specifically designed to take their heaters. These not only make transporting them from your car to your cart a breeze but ensure they remain clean while not in use. Depending on the type of model you chose will depend on just how portable these heaters are. Models designed to fit into the cart's cupholder are lightweight, highly mobile units. You need to consider not just the actual weight of the heater but that of the fuel cylinder that runs it. These small, portable cart heaters have been cleverly designed to mount into the cupholders of the majority of buggies so setting these up couldn't be easier, check that the model you chose has a cup holder adapter as this may be an item you need to purchase separately. These are often included in bundles though along with other useful kit so it might be worth checking out bundle prices too. As some carts have smaller cupholders, ensure that any design you chose will be accommodated. If you are considering purchasing an electric style heater, check the design of the mounting bracket and whether it’s suitable for your cart. Keeps the radiant heat in the direction you set your heater. Dictates the way your heater starts, the smaller propane units normally have single push button ignition whereas electric units a simple flick or on/off switch. Anti-bump. This protects you while you are driving over uneven ground, helping to prevent the heater from potentially falling and causing burns or fires. Tip over safety switch. This will prevent accidents if your heater is tipped over - easily done if you're driving over the rough terrain around a golf course. Hooks. Ideal if you prefer to hook your heater up higher or you haven't got a cup holder adapter or cup holder in your buggy. Exterior protection. This protective metal casing guards against accidental burns and fires by surrounding the heating element. Automatic shut-off. This immediately shuts-off the fuel in the event a unit is tipped over. 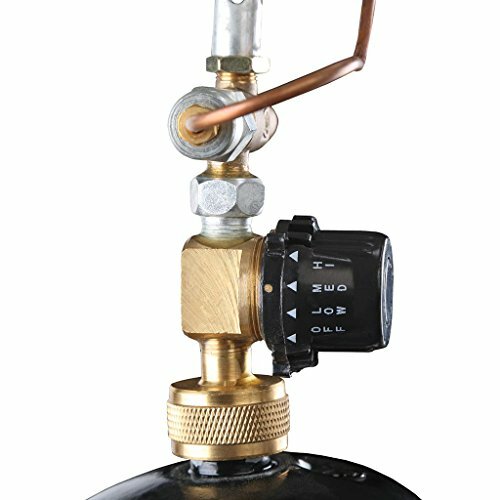 Pressure regulator. Enables peak performance whatever the altitude. Low-oxygen detector. This often overlooked safety features isn't seen in all golf cart heaters, and it is something to consider seriously, especially if you have zipped flaps on your cart creating a small enclosed space. This feature automatically cuts out the fuel if a low level of oxygen is detected. One of the most critical aspects of using any such heating device is understanding the potential risks (though small) of things such as carbon monoxide (CO) poisoning. CO is odorless and silent and can kill in minutes. Good quality heaters will have automatic shut-offs to help prevent such accidents from occurring, but it's vital to know the signs of CO poisoning so that you can take immediate action - it might just save your life or that of a friend or family member. Take a moment to read this simple guide on preventing CO poisoning and the symptoms you should know. If you suspect anyone is suffering from CO poisoning, take immediate action - leave the area and seek fresh air. Call 911. It's also important to check whether your heater is certified for indoor use, outdoor use or both. Not all heaters can be used safely in all situations. This allows you to fill the 1-lb cylinder that the heater uses from a 20-lb tank, saving you money. NOTE: The State of Massachusetts and Canada are extremely strict in their allowance of the use of specific gas-fueled heaters. So, if you are planning on playing a round across the border or in the beautiful State of Massachusetts, then it is advisable to check before you take your heater with you. 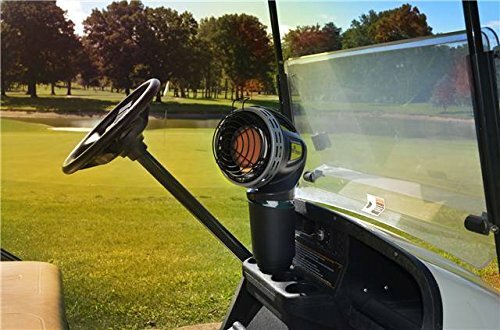 The Mr. Heater Golf Cart Heater puts out 4,000 BTUs so you can be sure that this will keep you nice and warm whilst you are transported between holes. 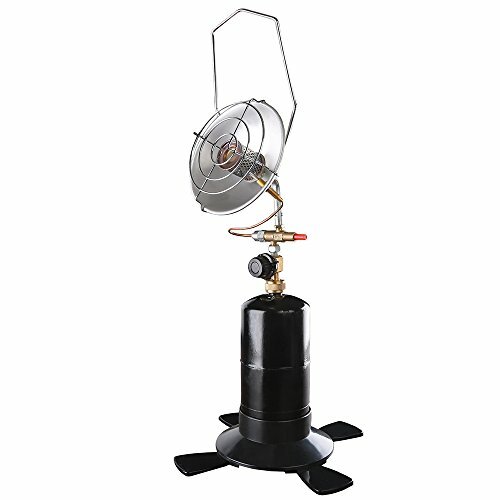 Furthermore, this heater is able to last up to 5 and a half hours hours one a single 1 pound propane cylinder. The ODS feature is one that's only found on the Mr. Heater and not other models. This is one of the main reasons why we picked the Mr. Heater as the best golf cart heater as safety should always come number one above everything else considering how deadly carbon monoxide poisoning can be. Some users have stated that the heater is a little wobbly in the cup holder and others have stated it fits snuggly. The fit really depends on your cup holder size it seems. 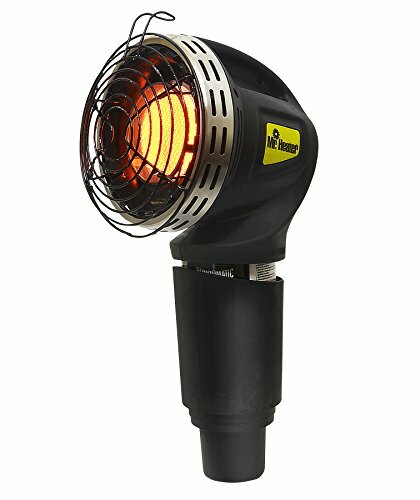 Overall this is a solid a compact heater that should keep you cosy in your golf cart as you travel around the course. Some complaints with being too loose in cup holder. A great little heater that includes peace of mind safety features not seen in other golf cart heaters. Also a well priced heater that should last you for many years to come. 7.5 x 7.5 x 10.5"
A disappointing heater versus others in the same category. The cheaper price point is not worth the saving as this lacks features other heaters have. This is number 2 on our list of 3 of the best golf cart heater you can buy. It produces 3,000 BTUs and can run up to 6 hours. Its design is a little ugly and basic however it does the job if you need a budget golf cart heater then this is probably the best golf cart heater for you. Although it's worth noting that this lacks some safety features such as ODS. 10.7 x 7.4 x 7.4"
Overall the 2nd best golf cart heater we have reviewed. Although we would still highly recommend the Mr. Heater Golf Cart Heater. For us there is one clear winner when it comes to picking the best golf cart heater on the market. Our choice is the Mr. Heater Golf Cart Heater. It gets our pick because of its safety rich features including ODS and tip-over switch. It's simple to use thanks to its one button push ignition and can output 4,000 BTUs for up to 5 and a half hours. It's cup holder adaptor allows it to fit into a golf cart cup holder with ease and it connects to a 1lb/ propane cylinder. 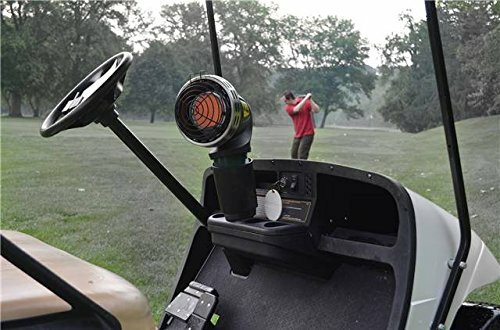 It beats the other golf cart heaters reviewed in this article hands down thanks to its safety features which is why it is our choice as the best golf cart heater you can buy today.